This week's Better Know a Blogger features Stats from De Silentio Umbrae. I first became aware of Stats' blog during the awesome Monster March event. 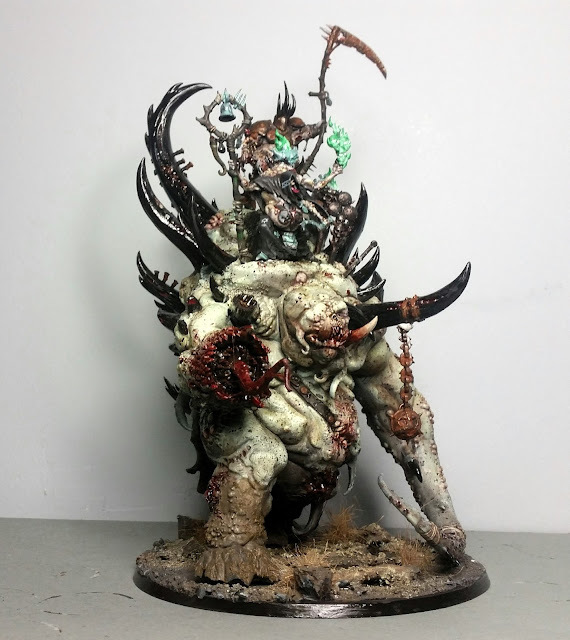 He had pledged to paint up his Glotkin model, and I took great joy in following his posts. As you can see from the end result, it was a series that was well worth following. 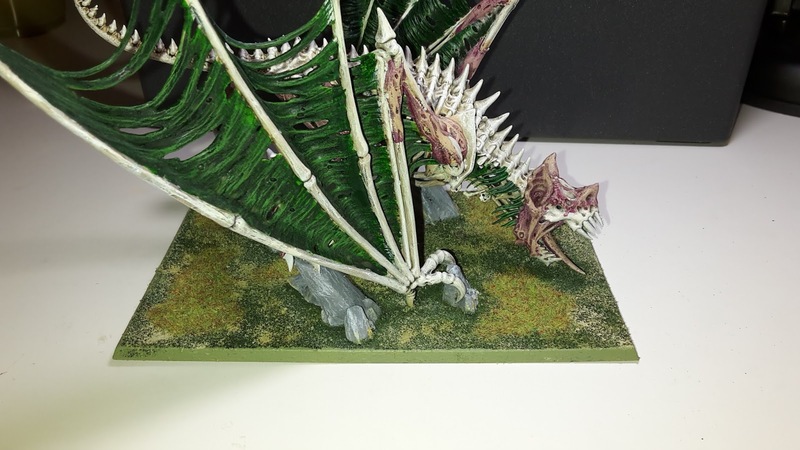 There is a ton of great posts on De Silentio Umbrae showcasing models for his Nurgle Daemon army. 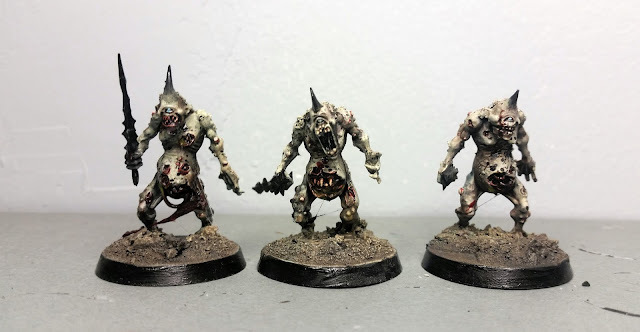 I love the style of his painting for this force, as it really brings out the decay and corrupted nature of the Nurgle Daemons. 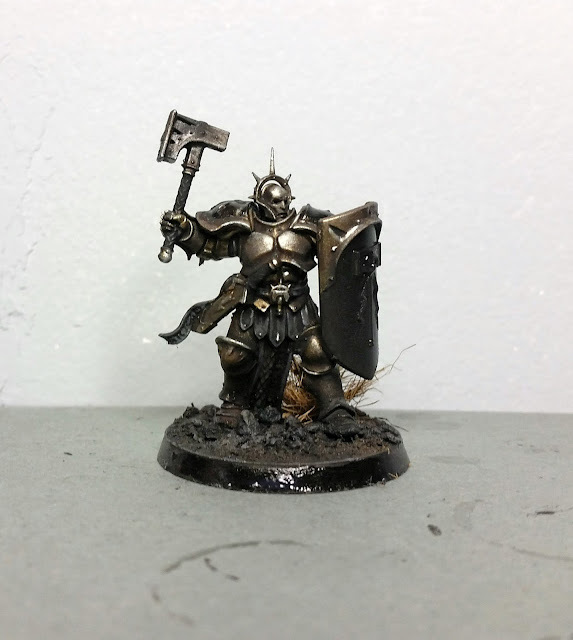 Most recently, he has been working on models for a Stormcast Eternals army. Again, I really like the muted look of the colour scheme that he has gone for. 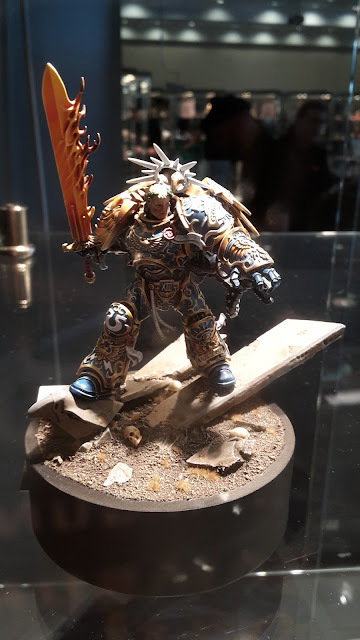 Many Stormcast armies are very bright, featuring larger than life models in bright golds and blues. I think that the style that Stats has chosen is a really great contrast to some of those other armies, creating a very effective Stormcast that is quite different to what you normally see. 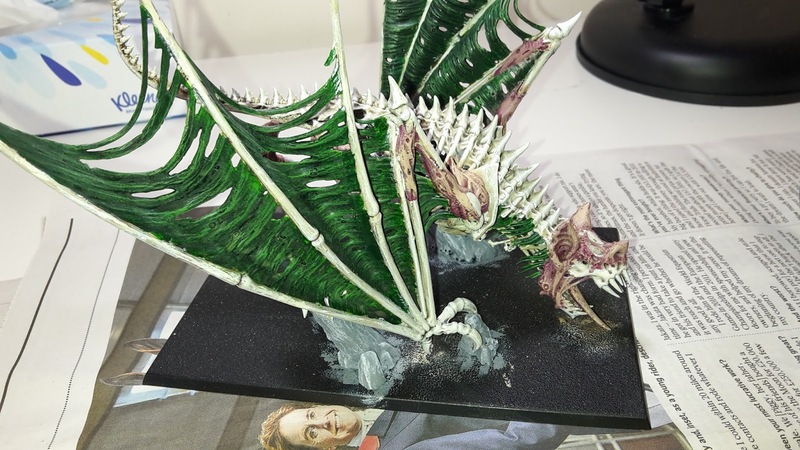 Not only do you get to check out some great painting on the blog, you will also find a wealth of tutorials, where Stats guides you through how to create the same types of models for your own army. 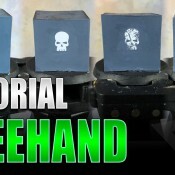 This is a great place to learn about his process and to pick up a few tips along the way. If you haven't come across De Silentio Umbrae yet, be sure to check it out and give him a follow for some great content. I started the hobby quite young, when I was thirteen years old or something similar. 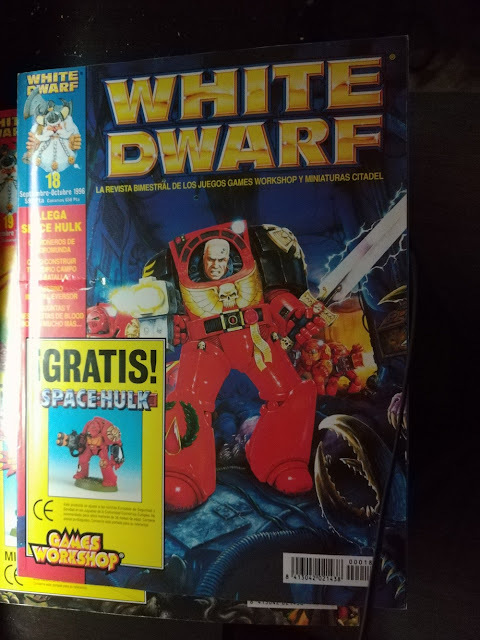 In my country, GW sold in the newsagents a kind weekly product about WHFB in collaboration with a famous publishing house, and in each number there was some miniatures, rules, background etc. I was shocked and I started with it. After some years, I took a long hiatus on the hobby, and I restarted three or four years ago. 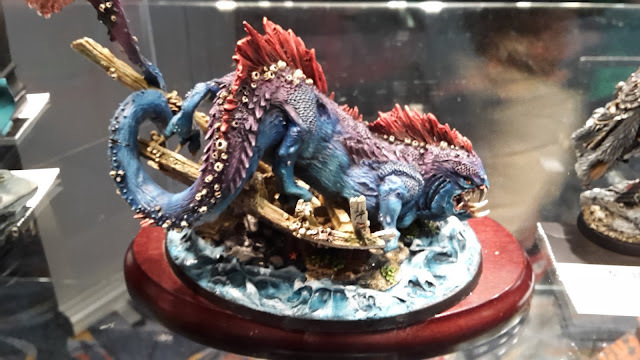 My second photo post from Warhammer Fest features some of the displays from the event, as well as some of the armies that were on display. I was attending Warhammer Fest down in Coventry at the weekend. There were some great displays at the event, including the Golden Demon painting competition. I will have a few photo posts and battle reports from the event to post, starting today with some of the Golden Demon entrants. This week, I will be sharing a battle overview of a game of Age of Sigmar at Newcastle Warlords. 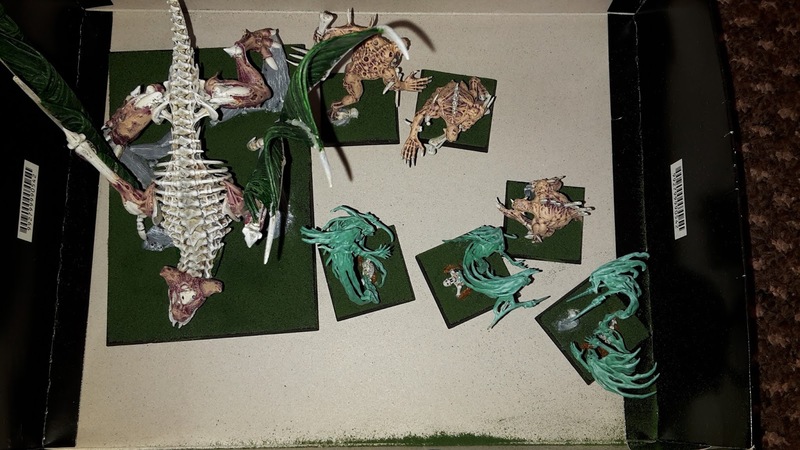 I recently decided to give Age of Sigmar another go. I've been hearing good things about the game since the release of the General's Handbook. Newcastle Warlords are running an Age of Sigmar escalation league, so it is becoming very popular at the club. This will not be a full battle report. I was too busy trying to remember the rules and looking up my unit rules to take such detailed notes. This will be more of an overview of the game. A fairly generic army based on my Vampire Counts army. 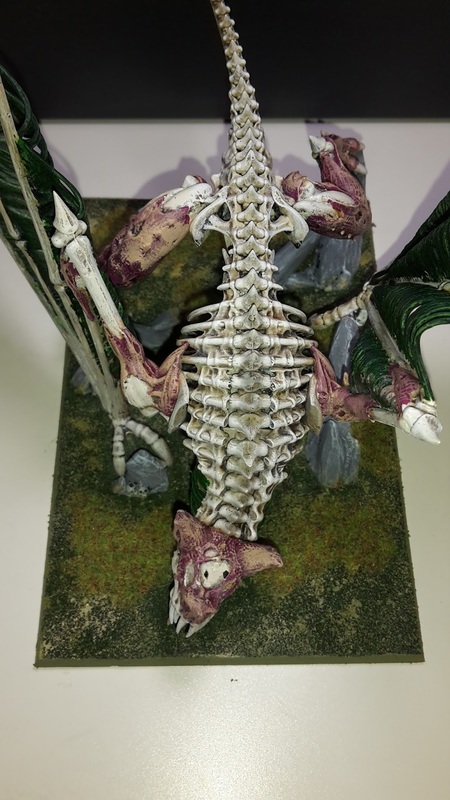 I really don't know what is good in Age of Sigmar in a Death army. Hordes of Skeletons and Zombies get some really nice buffs in large numbers (bonus to hit and wound or extra attacks), so I took a few units of them. The Necromancer is a good character, able to pass wounds onto nearby units on a 4+. This makes it easier to keep him alive for longer. Another week, another host of 8th edition 40k reveals from Games Workshop. Below you will find a summary of some of the information revealed in the past week, and some of my thoughts on what it could mean for the game. I'm not going to go through every release, as I simply don't have too much to say on many of them. I was excited to see what we would finally get to use those Command Points on, and I wasn't disappointed. A re-roll of any single dice may not seem like a great bonus, but this could be vital in many situations. How many games have you fluffed a low charge roll or failed to penetrate with that Meltagun? This could be a potentially game winning ability a lot of the times. Counter-Offensive is also intriguing. Given that charging units will strike first, this could be used to seriously disrupt your opponent's plans if you get to strike with a unit first, hopefully taking out a vicious enemy unit before they get a chance to attack. Insane Bravery is also a great bonus to use. 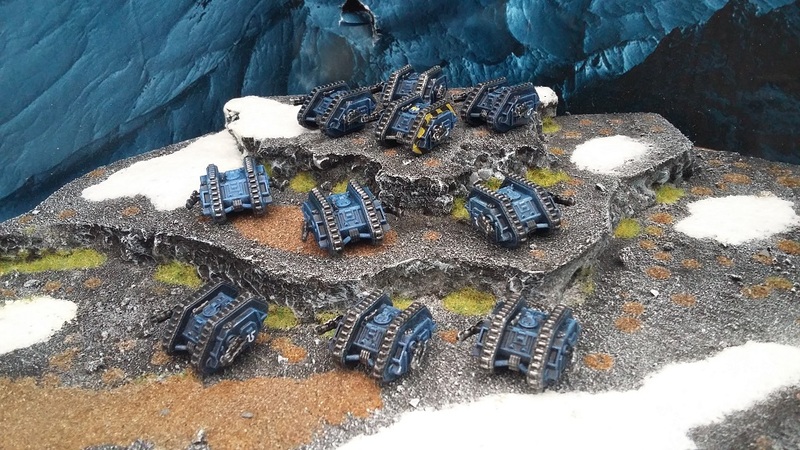 Weaker units such as Guardsmen or Orks will greatly benefit from this I imagine, as a single turn of significant casualties could decimate the rest of the unit. Allowing you to ignore the effects of Morale could be a great boost and swing the battle in your favour. I also like that we will apparently be getting army-specific Stratagems and mission-specific stratagems in the game. 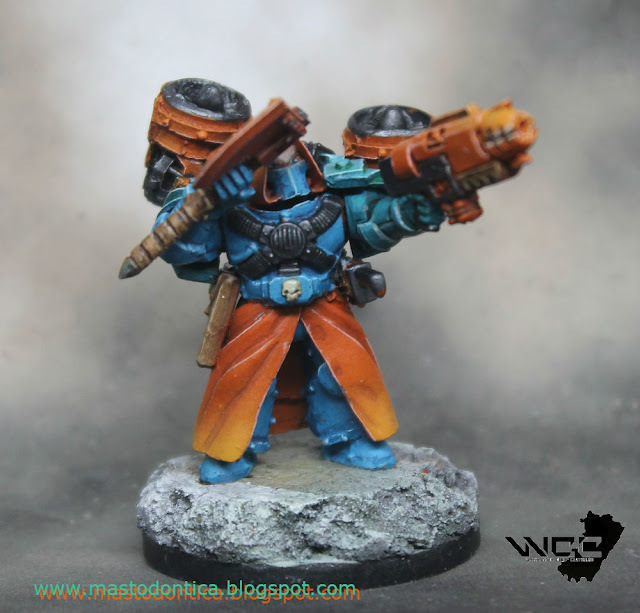 This week's Better Know a Blogger features Dean Kelly from Wargames Wasteland. I think that I first came across Dean's blog on Google+, where he is a regular poster and contributor. 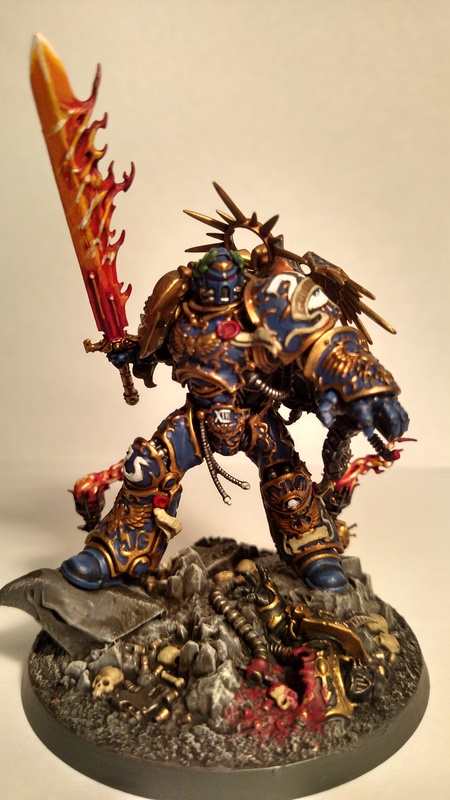 What first caught my eye was his awesome work on his Epic 40,000 Space Marine army. I've never played Epic, but have always loved the look of the game since I first started reading White Dwarf many, many years ago. His blog features a whole host of awesome hobby content to check out too. 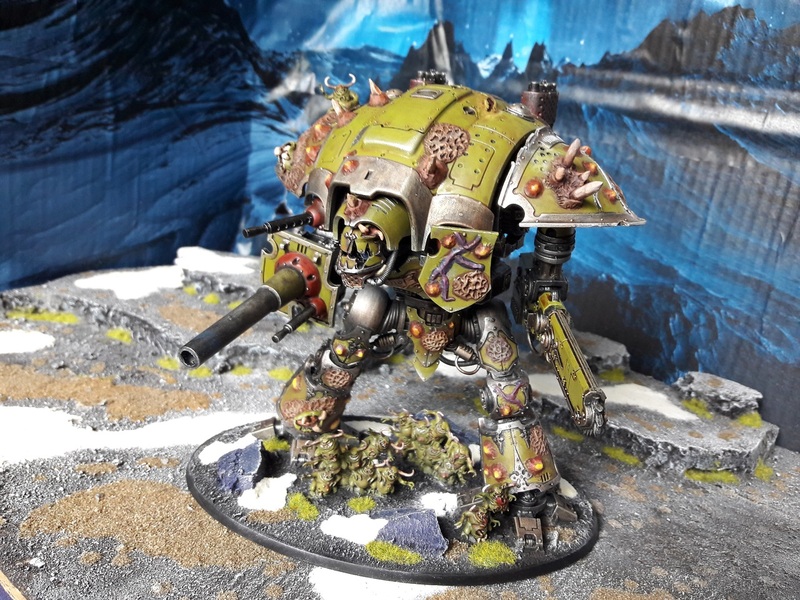 Most recently, he has been working on a great converted Nurgle Knight and dipping his toe into 30k with a Death Guard model. I was about 17 and into roleplaying. A guy moved into the area and joined the group and brought with him a copy of the AD&D battlesystem rules and an Atari ST with the "Universal Military Simulator" game. I was hooked and shortly afterwards got into Warhammer Fantasy Battlesbridge 2nd edition. 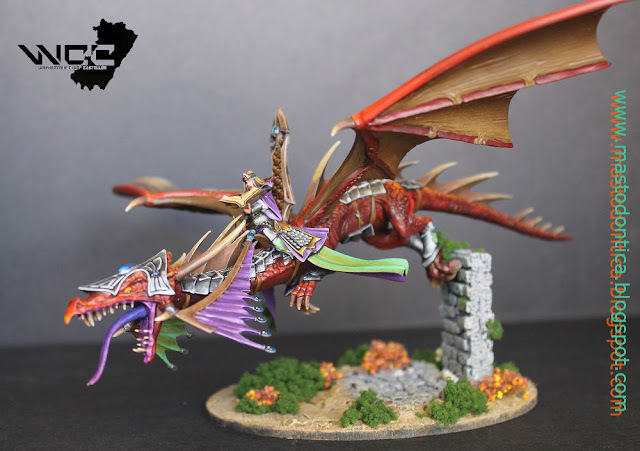 This week's Better Know A Blogger features Gary (AKA Castigator) from Castigator's Chaos. 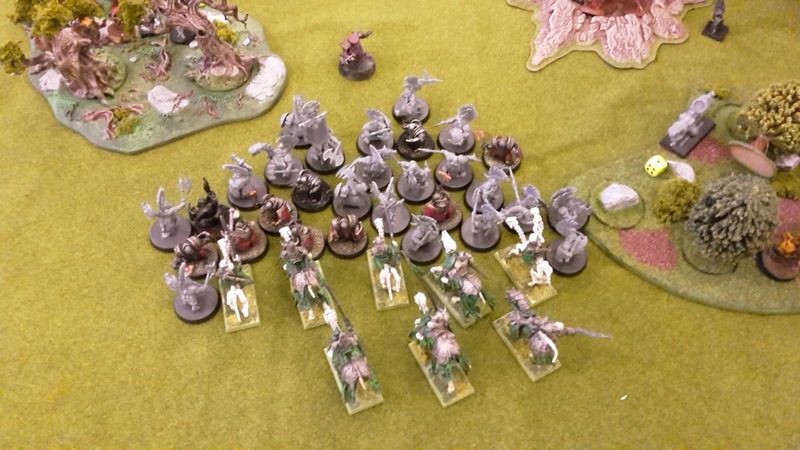 What first attracted me to Gary's blog was his awesome tournament overviews/battle reports. 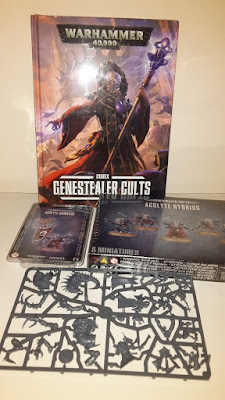 These feature some very quick battle reports of his games, pictures of his fantastic army and thoughts on how he performed in his games. 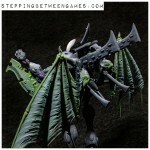 You should also check out the blog for pictures of his awesome Slannesh-themed Chaos Space Marine army. This is a fantastic force that is really shown off in all his photos. As if that wasn't enough, there are also a number of other writers who contribute to the blog on a regular basis. This means there is a lot of variety of subject matter and writing styles on the blog, enough to keep you interested and coming back for more. From a very early age I was always into board games, I used to drive my parents mad wanting to play the latest board game that I’d received for Christmas or my Birthday. As I got older, I would scavenge bits from these old games and design my own. My games would be terribly complicated affairs that nobody but me knew the rules to. I grew up on TV shows like Sapphire and Steel and the Tomorrow People, interspersed with a mix of 2000AD and Marvel comics (yes, they still called them comics back then) so they were invariably fantasy and Science Fiction based games I designed. Fast forward several years later and I happened to be passing this new shop that had opened up in Leeds called Games Workshop. Despite the protestations from my then girlfriend, I went in and discovered that the games I had being trying to design as a kid already existed. That would have been early ’87, a few months later Rogue Trader was released and my real gaming obsession started in earnest. 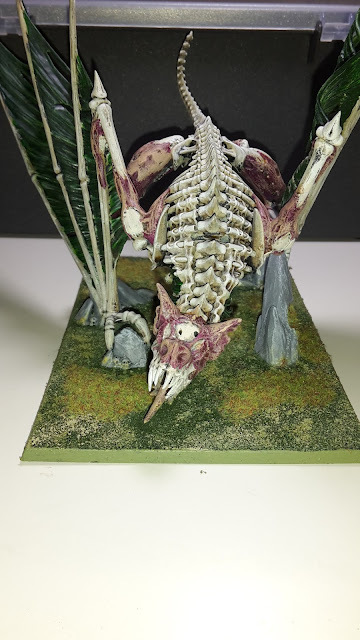 This week, I have been finishing off the bases for some of the units in my Vampire Counts. First up, we have the Terrorgheist. I had planned to get this finished in March as part of Monster March, but my boarding injury put paid to that! However, it is now complete. I hope to get some games of Age of Sigmar in with this, to see how impressive he is on the table. Another week gone, another host of 8th edition hints and reveals released by the Warhammer Community page. This post will take a look at some of the information that has been released and my thoughts on them. The last post covered aspects of unit and weapon profiles, movement phase, psychic phase, shooting phase and charge phase. The biggest news from the fight phase is that charging units strike first. This is a big change from the current edition, where you can spend several turns charging across the board to be slaughtered before you get a chance to strike. My Orks are particularly interested in this new development, and will hopefully become a force to be reckoned with in the new edition of the game. I will be interested to see if this rule applies to weapons that traditionally struck last, such as Power Fists. Interestingly, in the fight phase you get to move 3" to try and engage more enemy units in combat. This seems like a way to get into multiple combats without having to suffer the overwatch fire of the enemy units. This will make careful positioning of defensive troops and attacking units quite important in the new game. Much as was expected with the loss of the initiative value, combats will be performed by choosing alternate units to attack, much like Age of Sigmar. This adds further tactical depth to the fight phase, as players will have important decisions to make; Do you choose a weaker unit that is likely to be wiped out to attack first, hopefully taking down a few of their opponents or go for a strike with your units against an Imperial Knight to try and take it out before it crushes you? I will also be interested to see if things like Thunder Hammers and Power Fists get to strike first on the charge, will strike in normal order or will have to go last in each fight phase? I'm hoping that they get the chance to strike first, as that could potentially make Terminators awesome once more. Hitting on a 2+ in some combats is also a nice bonus for certain units in the game. 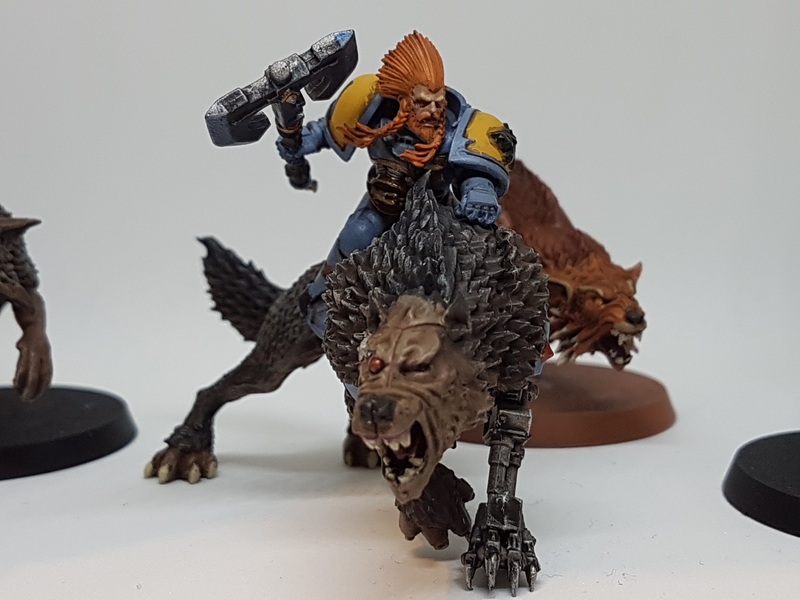 Welcome to the latest in my series of articles looking at the evolution of different aspects of 40k. This time I will be looking at the evolution of the Orks from the 2nd edition codex to the current state of the army as 7th edition comes to an end. I am not planning to cover every aspect of the codex and army, but will look at general trends in how the greenskins have evolved over the course of the 6 editions to become what they are today. 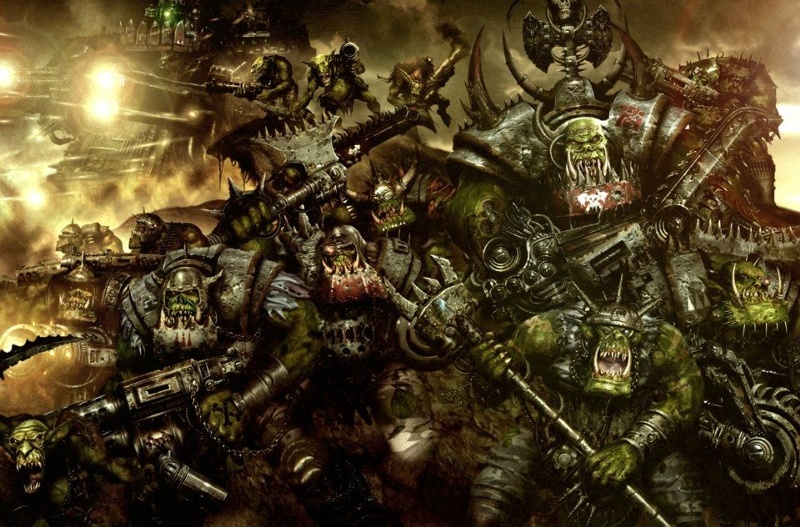 The Orks have come pretty far in the many years they have been in 40k, developing their own flavour and playstyle over the course of many editions. Orks are generally regarded as one of the most "fun" armies available to play. 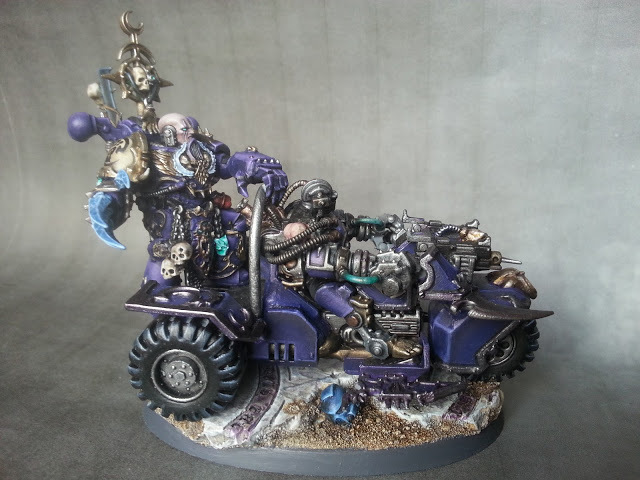 Much of this comes from the randomness inherent in their rules over the years as well as being one of 40k's best armies when it comes to kit-bashing and conversion work, especially on their vehicles. Unlike the standardised tanks of the Space Marines and Imperial Guard, no two Ork vehicles in an army need ever look the same. I first started with the Orks with the release of GorkaMorka (more on this to come), building up my mob and fighting with my friend's mob for many glorious battles. This gave me my first taste of kit-bashing when I decided to convert one of my wartrakks with parts from a toy car in order to give the vehicle an increased transport capacity (in GorkaMorka, how many Orks could ride in a vehicle was determined by how many Ork models would actually physically fit on the model). My first forays into using Orks in 40k came midway through 3rd edition when the same friend decided to sell off his starting Ork army and I bought it. 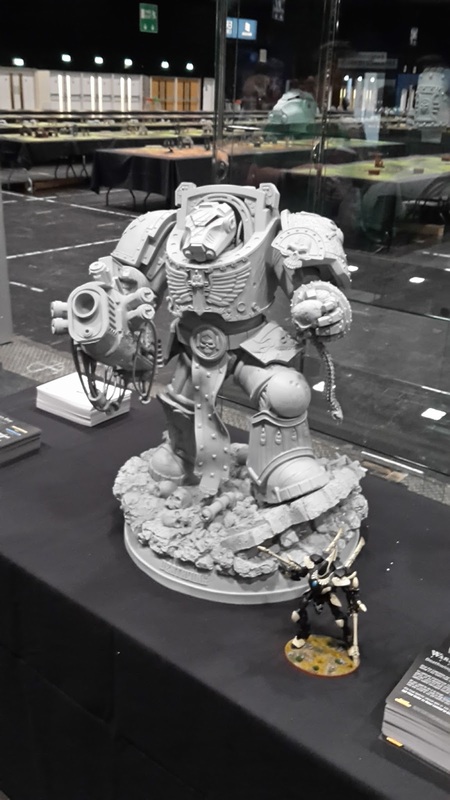 This gave me a warboss, two large mobs of unpainted boys and a few vehicles with which to start my warband. I have been playing Orks ever since then. They have remained one of my favourite armies, and though they have fallen on hard times in more recent editions, I still have a special place for them in my 40k collection. While researching this article, I came across another nice article on the development of the Orks from Rogue Trader to 3rd edition. This is well worth a read for anyone looking for information on the earlier years of the Orks. This week's Better Know A Blogger features Cylde from Mastodonica. Cylde got in touch with me about taking part in Better Know a Blogger, and I am glad that he did! Mastodonica is a blog written in Spanish, so I generally wouldn't have bothered attempting to read it otherwise. That would have meant missing out on some awesome painting skills from Cylde. Translating the page into English actually does a pretty decent job, allowing me to follow along with most of the articles. 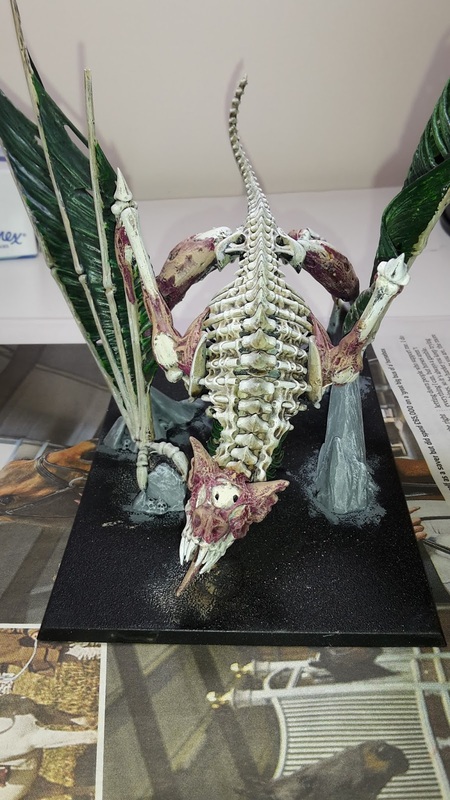 Cylde also took part in Squaduary and Monster March, producing some epic models to add to the challenge. 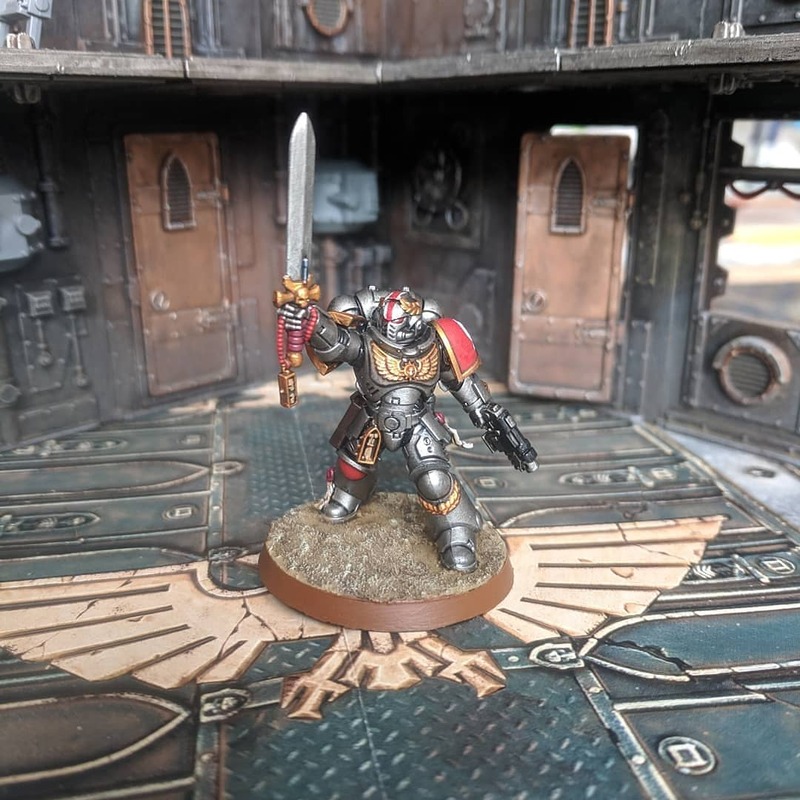 Most recently, he has been highlighting his work on Adeptus April, another month-long hobby challenge to get a squad of Marines painted up. It’s a long time since that moment, but I was nineteen or twenty, don’t remember that exactly, maybe it was 1979 or 1980. My friends and I started playing RPG’s at university, after that Magic the Gathering and board games and seeking for magazines of adventures I found one with a little toy. That was Spanish White Dwarf nº 18 (1995). Then I started with high elves and later with space marines. When I left university I changed my city due to my job, and when I returned four years later, my group was broken, I got married and children came. But I never gave up painting. Now I found other people who play 40k, and we have a wonderful group of friends. And my armies are still growing. Hobby Sunday returns with some continuing work some of my Vampire Counts army. First up, I was able to flock the base of my Terrorgheist. Once dry, this will be given a drybrush of Bubonic Brown and Bleached Bone, followed by some static grass. 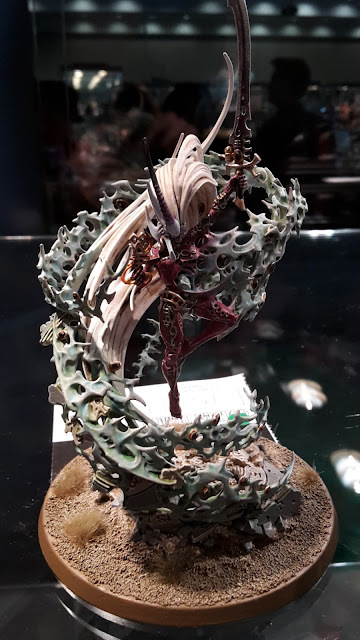 This will bring it in to line with the rest of my army. 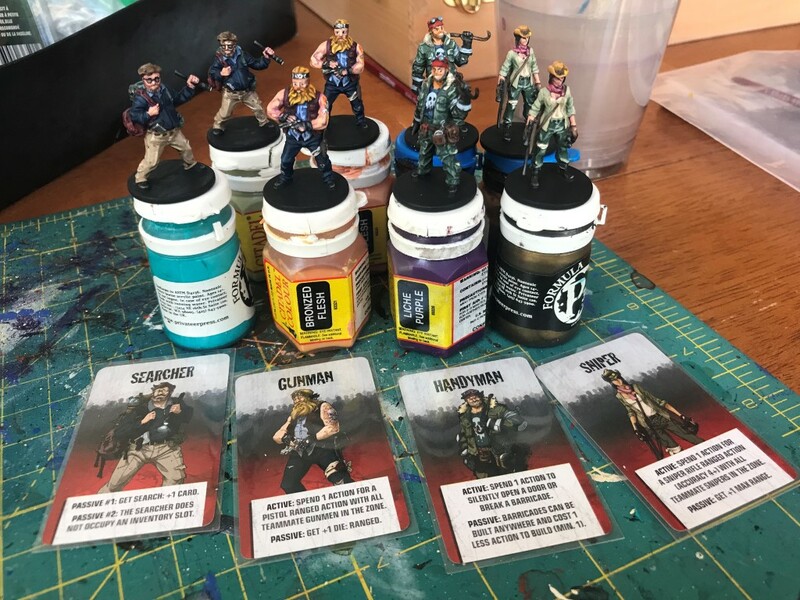 Last month, I was running a giveaway to celebrate St Andrews Wargaming turning 2 years old. I got a fantastic 57 entrants for the competition and a bunch of new followers (who will hopefully be sticking around). Last night, I did the draw for the prizes. First place went to Tom Byrne. Tom snuck in at the last minute to win the grand prize (he was the last to enter the competition 31 minutes before closing and somehow managed to get the win). The start of a Genestealer Cults army will be on its way to you soon. Hopefully they continue to be a fun and flavourful army in 8th edition. Incidentally, Tom's favourite special rule was Atonement Through Honour, a recent addition for the Deathwatch. Second place went to Chris Rhode. Chris is a regular commenter on the blog and has even written a guest post. He gets the choice of either the 2nd edition card terrain Power Plant or Imperial Firebase. If you could let me know which one you fancy, I can get it shipped to you. Chris' favourite rule was Rampage. Great for helping you chew through a bunch of enemy models holding up your unit. Third place went to Iapedus Maximus. He will be receiving whichever terrain kit Chris does not choose. His favourite special rule was Flaming Projectiles, helping the Legion of the Damned punish the enemies of mankind since M.39. Thanks to all who took part and those that continue to follow and support the blog. The information has been coming thick and fast from GW over on their community page. Each day, new details about 8th edition are being released and feverishly discussed online. In this post, I will do a quick round up of what we have found out so far and give you some of my thoughts on the information. The Community Page gave a sneak preview of some of the unit profiles that will feature in the new edition of the game. As was previously revealed, individual movement values make a return to 40k. I actually quite liked the old system of standard movement for units in 40k. You knew each infantry unit could move 6", a bike or assault unit moved 12", etc. Perhaps it didn't fit the background that a Guardsman was as fast as a Space Marine, which was as fast as a Tyranid, but it was a nice, simple system. I can see the appeal of giving different units different movement values, but I think it will be a bit annoying trying to remember the different movement values of all the units that you may be facing. 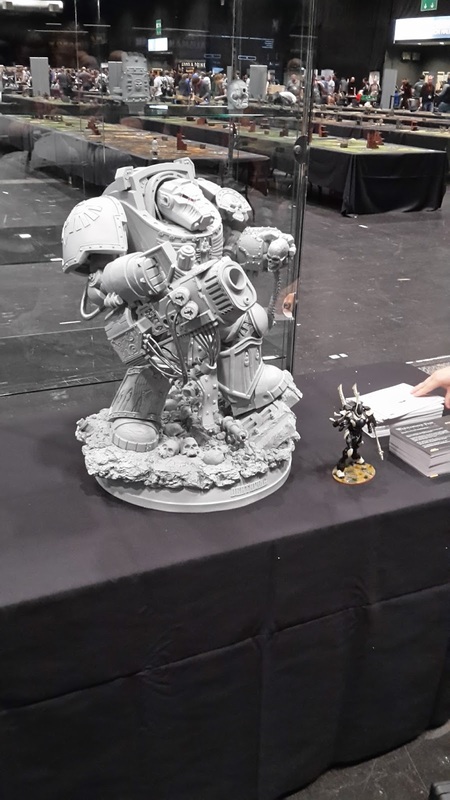 I am glad that they appear to be keeping 6" as the standard movement for units, as I would have hated going back to the 4" standard movement of 2nd edition.